On Saturday, April 29, nearly 60 Girl Scouts filled classrooms at the Bannow Science Center on campus for STEM (science, technology, engineering and mathematics) Day hosted by Fairfield University’s student chapter of the Society of Women Engineers (SWE). Juniors and Cadettes of the Girl Scouts of Connecticut in grades 4-8 learned elements of electrical, software and biomedical engineering as well as teambuilding in a series of student-run sessions. 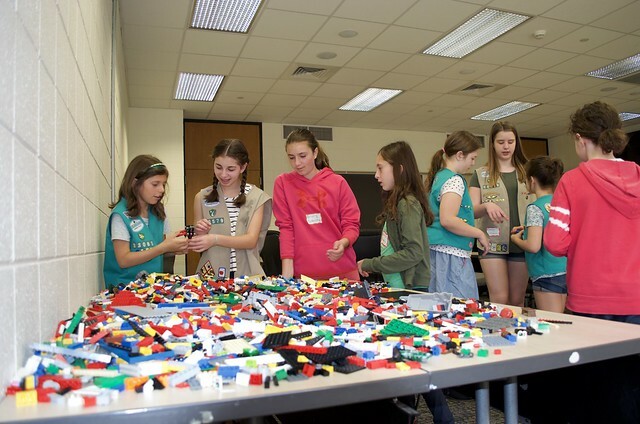 The Girl Scouts rotated between four activities: creating a penny battery, a coding session, building a lung replica and a Lego teambuilding event. The co-presidents of the Society of Women Engineers at Fairfield, Christina Ficaro ’18 and Kathryn Higgins ’18, planned the third-annual event because they want to continue to show younger girls how exciting science and engineering can be and to affirm that STEM fields are not gender exclusive. Ficaro, a junior mechanical engineering student, said it’s important to her to empower younger women to take on roles in the sciences. “We want to make sure that these girls understand that STEM fields are very real options for them and that women are already making great strides in these male dominated fields,” Ficaro explained. Learn more about why Fairfield is Among Best in the Country for STEM Education.